“Everyone from derivatives traders to hedge fund managers want to predict financial market outcomes. Who wouldn’t bet on a sure thing? The reality is that no one can really guarantee where the stock market is headed. But don’t think people aren’t trying. Financial engineers are the folks that just might figure it out.” – reads the description on Baruch Master’s in Financial Engineering program website. Although that sounds a tall claim to me, the fact is that these programs are on a rise. For long, finance as a field attracts engineers because of the stupendous compensation packages as well as the glamor. While the traditional route has been to study MBA later in your career to move into Banking or Trading, why compete in those super-duper competitive Business Schools? Why not go directly for a Finance course? Enter Master of Financial Engineering (MFE) degree programs such as CMU, Columbia, Berkeley, UCLA, NYU, Cornell, Washington etc. Baruch is probably the cheapest of the lot but ranked quite high. The finance industry needs people who possess deep mathematical modeling skills and computational expertise. While no specific undergraduate major is required, most students will have a degree in quantitative subject matters such as mathematics, engineering, computer science, physics, etc. Engineer’s quantitative and programming skills lend themselves well to solving the complex and creative challenges of today’s financial markets. Although it is not related to traditional branches of engineering, the field picks a lot of people with engineering backgrounds (as is true with MBA). Financial engineering draws on tools from applied mathematics, computer science, statistics and economic theory to address current financial issues as well as to devise new and innovative financial products. What specializations are possible within MFE? One can venture into Computational Finance, Risk Management, Corporate Finance, Algorithmic and Technical Finance etc. 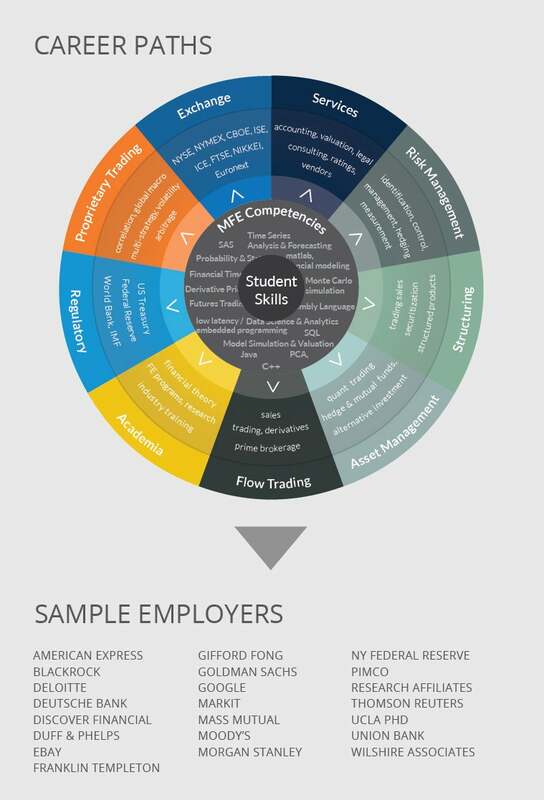 What career options open up after MFE? Following image is taken from UCLA MFE course website. As it shows, one can go into risk management, trading desks, financial services, quant pricing, regulatory roles etc. Often incoming students are also coming from similar roles and are looking for further specialization. In non-finance category, probably engineers make the biggest chunk of the incoming class. When should you go for MFE? If you have made your mind to get into finance industry and some relevant experience or background, MFE might offer you good opportunities with the advantage of lower competition than traditional MBA (Stanford MBA has acceptance rate of <6%). Plus, make sure you love Mathematics! How to prepare your application for MFE? Join us and we will guide you with our very strategic guidance! 🙂 Strong quantitative background, preparation for CFA, programming skills, mathematical modeling tools knowledge etc helps. Rest, we help you step by step in crafting a strong story and guide you through our selective sample SOPs.